The exhibition build is nearly complete in the foyer and gallery. I’ve decided, in conjunction with my tutors, to concentrate my exhibition work on the recent project I completed at Wells next the sea. To this end I added two more small oils to the six already completed. Then I made one slightly larger image in Acrylic for speed…. An image conjured up from my memory of the Cornwall residency. Used an old canvas with roughly similar colour palette to the one I wanted, then I let the paint run and expose deeper layers of colour. This was reminiscent of the deep layers of rocks and minerals as they become exposed by the sea along the coast in Cornwall. 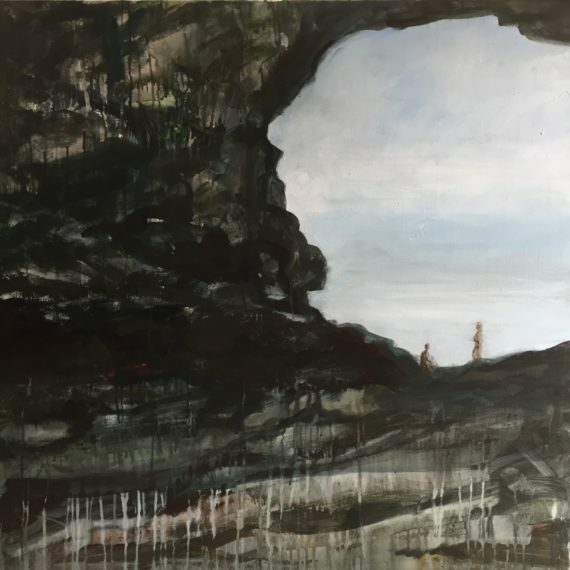 The image morphed into a cave with two figures dwarfed by the magnificence and wildness of the landscape. I managed to stop while I was ahead for once. I think the urgency of the moment had something to do with it. But I also think I’m becoming more at one with the subject matter and general direction of my practice. My work is now more gestural but I must be aware of the danger of slipping back into figurative mode. 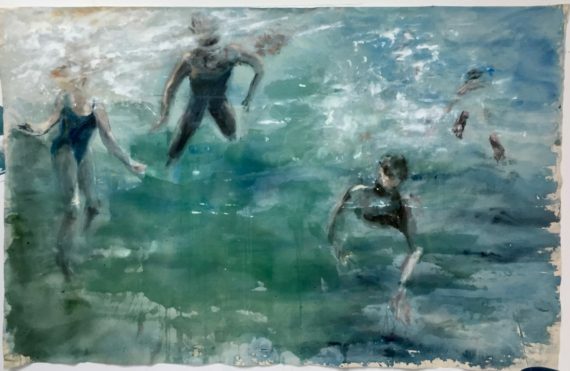 This happened when I painted three images of dancers after the much freer large acrylic on paper. These will not figure in the exhibition even though they did contribute to an advancement of my work. There is a need to keep reviewing what I do . There is no time to backtrack now I’ve arrived at a way forward in my paintings. MA Degree Show, Almost there! Well with just two weeks to go till assessment and the Exhibition it really is urgent. We’re lucky enough here at Suffolk Uni to have great working spaces now that the BA students are away. A few of us have taken over the top floor of the art block and there’s never been such frantic activity. It’s so good to have the constant company of like-minded people around to share an informal crit., chat and general support. Yesterday a couple of tutors dropped in too so quite a sociable day. But what about the ‘work’??? Well personally it’s going well at the moment. 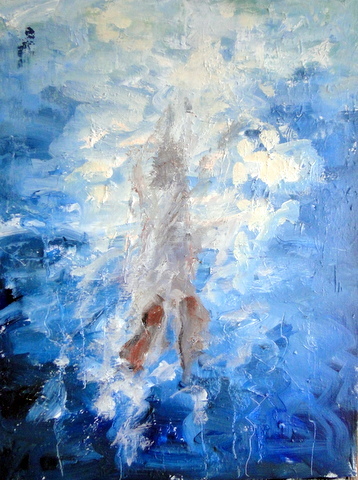 This large underwater image on loose canvas was a bit of an afterthought following on from my ‘Leap of Faith’ painting. 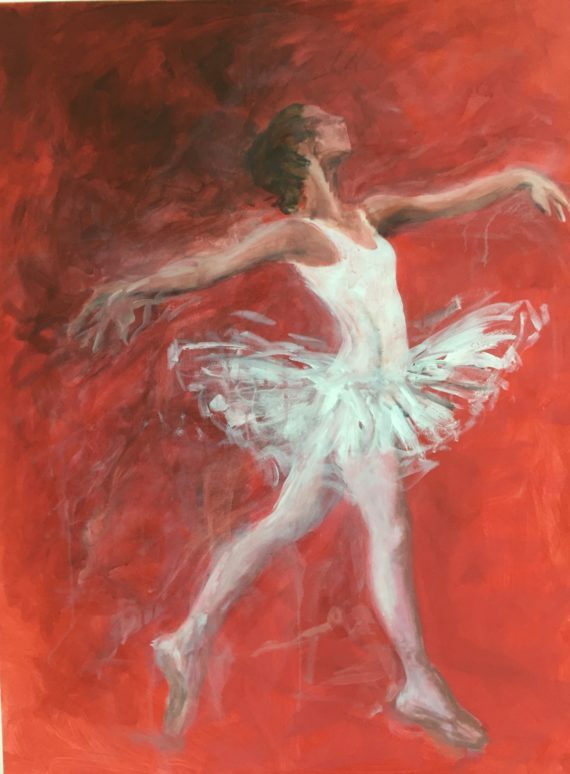 The ballet dancers I’d started weren’t going well so as light relief I started this large canvas and it just took off. Thoroughly enjoyed doing it which proves the value of advice from a friend to paint what I love most. My work is becoming more and more gestural in style, I think. I returned to the dancers and made them much looser. They had become really uptight and far too figurative. The one below is about complete now. But this next one is proving difficult. I’m not aiming for complete anatomical accuracy. 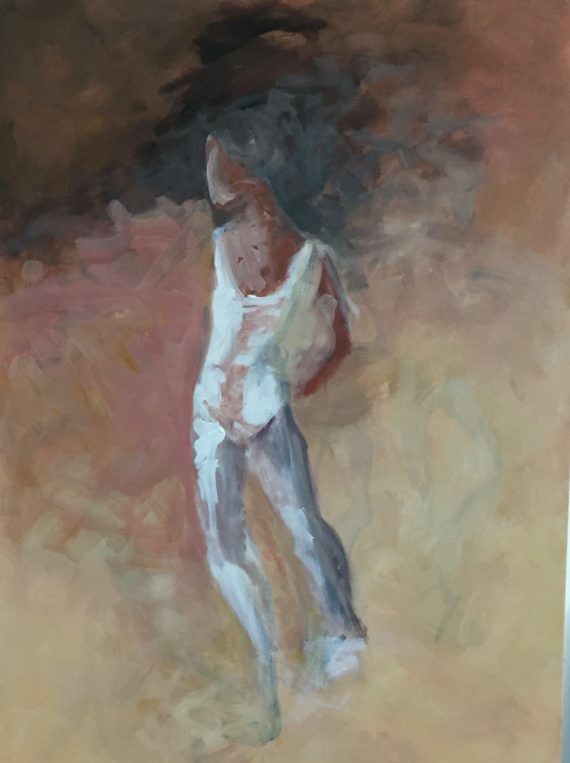 The movement is more important to capture yet I find it impossible to maintain the integrity of the painting without starting from a well-drawn pose. Once I establish that I can then abstract and add a sense of what I feel about a subject. Hopefully this will be sensed by the viewer who can interpret the completed image by imposing their own personal reaction to what they see. This has a way to go still but I hope it’s getting closer. The human figure is firmly back on my radar of what to paint now. I was stuck on landscapes for the last few years but have well and truly returned to my love of figure-drawing. The wisdom of the quote I mentioned a few blogs back rings so true ….’you always return to the things you are trying to avoid but you come back stronger’. Decisions have to be made about what goes into the exhibition next week. I’ve managed to complete most of the written work now and must think carefully about what I need to say in my Viva. How do you sum up two years of research and thinking about a subject? It has been such a fantastic and at times, excruciatingly difficult and challenging experience but one which has had a profound effect on my art practice. I’ve also made some very good friends in the process. I was told at the beginning that it would be life-changing and it has been.